The DRBC lawsuit now before the 3rd Circuit Court of Appeals will decide if states surrender their sovereignty to bureaucracies when they enter compacts. Late last month, I reported here on the status of the DRBC lawsuit, which, following some blistering observations from the district court judge about the DRBC position, was kicked upstairs to the Third Circuit Court of Appeals. It was headed there regardless of the outcome and got there roughly a year ahead of time. Now, the case will be decided on its merits. The court will decide if DRBC bureaucrats can expand their definition of “project” to include whatever they choose and whether they can impose moratoriums on what they choose by merely pretending to work on regulations ad infinitum. The court will decide if a bureaucracy created by compact has sovereignty over the compact itself and those who created it. It’s a case that should compel every state that cares about its soverignty to get involved. Signing of the Delaware River Compact in 1961. Who knew then it would lead to creation of an oppressive regional land use agency? The DRBC lawsuit was prompted by three outrageous actions taken by the Delaware River Basin Commission. The first was it’s flagrant abuse of the term “project,” which has always determined what it could regulate. 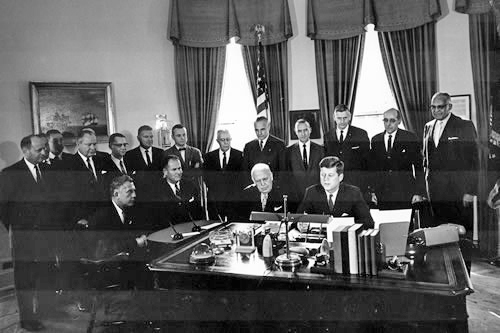 The term is central to the interstate compact that created the agency. 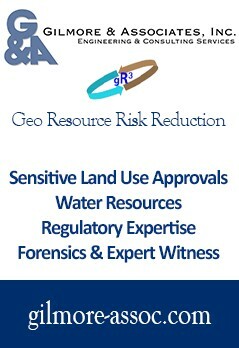 Following decades of common understanding that “project” meant a water project as in a well, a reservoir or a wastewater disposal project, the DRBC, under its last Executive Director’s ideological leadership, blithely expanded the term to include land uses having only indirect connections to water; things such as gas well pads and pipelines. It’s mission creep; jurisdictional overreach by an unaccountable agency that ultimately results in the effective confiscation of private property. The second outrage was to then assert, because it was developing regulations, that the agency could impose a moratorium on gas drilling even though there has been no movement with respect to those regulations for nearly six years. “We’re still thinking about it” is no excuse. It amounts to neither permitting or denying activities, so as to avoid bearing any legal responsibility for anything. It’s hard to imagine any less ethical behavior by a governmental agency, except that there is a third outrage. That third outrage is the unholy alliance made between the DRBC and the Delaware Riverkeeper, which is little more than an arm of the anti-growth William Penn Foundation. The DRBC, astoundingly, even took funding for gas drilling related research from the William Penn Foundation as the latter was financing the Riverkeeper and as it, in turn, was suing the DRBC over gas drilling issues. Meanwhile, the DRBC was stacking its committees with Riverkeeper associates, and using legal counsel associated with other Foundation funded enterprises. The DRBC Executive Director even joined the Foundation board upon retiring for a time and then secured a job at still another Foundation enterprise. This isn’t just winking and nodding on an interstate scale; it’s political corruption. Delaware Riverkeeper’s tribute to ally Carol Collier upon her retirement from the DRBC. This unholy alliance between two entities funded by the William Penn Foundation was a disaster for Upper Delaware River landowners. The DRBC has only such authority as is expressly given to it in the Delaware River Basin Compact. Natural gas well pads, wells and related activities are not – under any set of facts – “projects” as that term as defined in the Compact. The DRBC was, under the Compact, given authority to review and approve water resources planning and development “projects” such as dams, reservoirs, and hydroelectric power plants undertaken for the public benefit. It was never intended to be a multi-state environmental or land use regulatory agency with the power to review and approve commercial, industrial and even residential development on private property. A State does not cede its sovereignty over land use issues by entering into a compact for water resources planning. The DRBC Compact is one of dozens of interstate compacts entered into by States, many of which address the allocation and use of interstate water resources like the Delaware River. Permitting agencies created by such compacts to extend their jurisdiction at will usurps the state sovereignty of the members. For more than 40 years, the DRBC, without controversy, exercised its “project” review authority over water resource development projects, such as dams, reservoirs, water supply systems and water treatment plants. It never sought to review and approve the hundreds of industrial, commercial and residential developments along the Delaware River, many of which utilized major amounts of water during construction and operation. The DRBC understood “projects” are activities undertaken for the purpose of water resource development, not all human undertakings that utilize water. The DRBC, under public pressure from special interests, took a dramatic turn with respect to its own view of its authority in 2008 when it learned landowners and natural gas companies planned to develop natural gas resources. It was at that point the DRBC, responding to pressure the Delaware Riverkeeper (funded by the same tax exempt William Penn Foundation that also funded, in part, the DRBC itself), decided, for the first time, that “projects” could include any activities in the Basin that utilized water, including gas wells. Now, even pipelines are being considered “projects,” effectively turning the DRBC into a multi-state regional land use agency with powers exceeding that even of the member states. Building on its assertion of jurisdiction, and continuing to take direction from anti-development special interests (and the anti-shale gas development benefactors who were, and are, financing DRBC activities), the agency declared it would not consider “project” applications for natural gas wells until after it adopted comprehensive regulations to govern natural gas development in the Basin (another first). It has been thinking about those regulations ever since with no end in sight. The Wayne Land and Minerals Group (WLMG) sued the DRBC in the United States District Court for the Middle District of Pennsylvania in May, 2016, arguing natural gas wells and pads are not “projects” under the Compact. Following a hearing during which the DRBC’s current and former Executive Directors testified, the District Court pointedly and in harsh language rejected every argument made by the agency for dismissal of the case but, nonetheless and without discussing the merits of the case, concluded wells and well pads are “projects” within the Commission’s jurisdiction. This effectively and immediately (without further debate that would have ordinarily taken place at the district court level) kicked the case upstairs to the Third Circuit Court of Appeals where it was headed anyway. Because it is difficult, if not impossible, to identify any human activity, much less land development, that does not use water in some manner, the District Court’s decision arguably gives the DRBC virtually unlimited authority over the use of land. Housing developments, office buildings, schools, shopping centers, churches, factories, farms are now within its jurisdiction. It can now regulate, and even preclude, any or all such developments and activities. It can, if it wants, declare no such activities may lawfully proceed until it adopts regulations governing same and it can impose a de facto moratorium on any and all forms of development while it debates such regulations for years. The DRBC now has the police power formerly held by the member states. Every state involved in a compact is, therefore, threatened. The Court of Appeals will decide whether, and to what extent, States entering into interstate compacts cede their sovereign authority. It will determine how far a bureaucratic agency created by states can go in interpreting its way to control over those states. Ultimately, it will define the power of an interstate water resources management agency to regulate land use and abscond with not only state sovereignty, but also private property. No matter could be more serious or more deserving of legal support from other states (in and out of the Delaware River Basin), landowner groups or anyone else valuing American liberty. It’s that serious. If this is the first time the DRBC poked its nose into the activities of the gas industry, and if they can not reasonably demonstrate their authority over such activity, how come gas companies didn’t simply move forward with their drilling plans? How come it took eight years for a legal challenge, and how come come DRBC is not the plaintiff in the case? How come Pennsylvania state government hasn’t responded to the overreach and asserted the finality of state jurisdiction over gas development? I lost my gas drilling lease. I lost $250 thousand dollars because of the DRBC moratorium. Hess oil pulled out of our leases, legally we lost. It bankrupted our organization with the help of George Soros and his goon Josh Fox. Ww found the same group funding the Riverkeeper was funding the DRBC because states like NY were not contributing their fair share of dues. We also found out that the William Penn Foundation and RiverKeeper were one and the same and responsonsible for the moratorium. What a tangled web we weave when The Wolf and Cuomo both receive money from the likes of Soros, an anti-fracking kingpin. Need I go further? It’s all about the money and who can fight the big bucks of Soros. How long ago was it that there was a call for direct action, meaning civil disobedience, at the drbc now? Was that in the fall of 2011 while occupy was taking over parks? It’s interesting consider just how much civil disobedience there has been since the threat that day which drbc caved to correct? What was the most influential group early on? Was it deleware riverkeeper? Damascus citizens for sustainability? If it is over water why not truck in every drop ? Sooner or later they would have to cave .